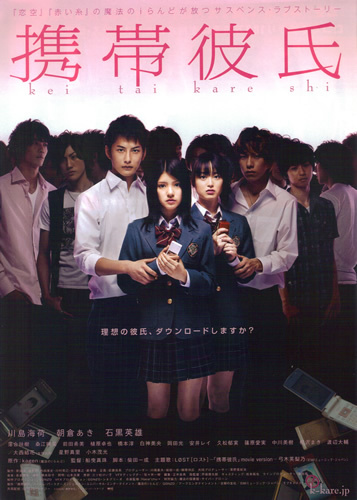 High school student Ayumi kills herself and leaves behind a cryptic message that says “will be killed by boyfriend.” Ayumi’s classmates Satomi (Umika Kawashima) and Yuka (Aki Asakura) investigates her suicide and quickly links her death to a cellphone dating simulation game called “Keitai Kareshi.” The game distributed by popular mobile gaming site “I-Scream” allows players to pick avatars and exchange messages with the “moile Bf’s” . A love gauge determines how well the player is faring. Gina May 05 2016 12:18 pm I watched it because of Uehara, Takuya. But I like it! PsychoticHatter May 18 2014 9:22 pm I'll rephrase what I put up earlier Motoki Ochiai may have played Masatomi. I really have no clue, but I want to know who plays each of the Kareshi's. 和彦君 May 16 2014 10:32 am I'll rate it 3 stars. PsychoticHatter Mar 02 2014 12:24 am Hime, http://asianwiki.com/Motoki_Ochiai I think that's the guy who plays Yuuji. As for Masatomi I have no clue. rumiko Dec 08 2011 12:00 am does anybody know who is the actor playing masaya? as the first keitai kareshi of yuka? タケルくん Apr 01 2010 5:47 am when does it come out on dvd, I really want to see this.